I just wanted to share my latest batch of handmade felted nuno scarves and my new dress from display. The scarves are a combination of silk and wool. 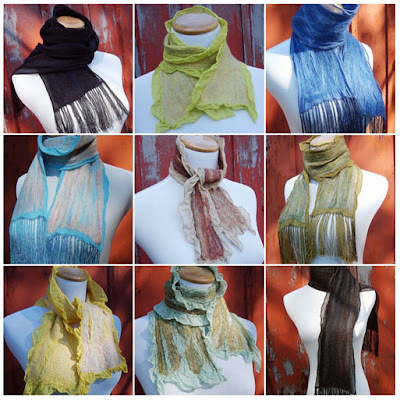 I hand dyed most of the silk scarves myself with the exception of the fringed scarves. And, of course, I hand felted each of the scarves to create their distinct one-of-a-kind look. These are now available in my Etsy shop. There are also more photos of them on flickr. And, I will be adding more listings of this style scarf to my Etsy shop and more photos to flickr as the weeks go by. It seems that I'm focused on making these for now as I really enjoy the process and results. The lovely new dress form was a recent online purchase that arrived late last week in the mail. I do really like my mannequin head display, but I wanted to try a dress form display and be able to take photos outdoors as well as give a different perspective. I think that so far so good with the dress form. I look forward to taking more photos with it. I had thought about using a live model which seems to be the route that many fashion and accessory designers are going, but I'm going to concentrate on using my mannequin head and dress form as displays for the time being. They don't charge fee for each photo shoot and never talk back. Those are so beautiful! I love the fourth one, such a wonderful shade of blue. I hope you don't mind me asking, but where did you get your dress form? Your dress form looks great as do the scarves! Wow--your scarves are sooo beautiful!! Very nice. scarves are adorable! It's hard to chose one, all are great!